The recent news of Amazon purchasing Whole Foods is shocking the grocery category. The largest eCommerce play now has a 465-store foothold within the category. Articles like this in Ad Age are predicting utter dominance of Amazon within the grocery category. Is Amazon the future of grocery retail? Or is the future much more complex for just one player to dominate? To answer this let’s start with what Amazon does well: integrate into life. Amazon is constantly trying and implementing tactics to make purchasing seamless. Examples like the Dash button, Alexa, drone delivery, Amazon Pantry, and Amazon Go are all strides making shopping easier. Now imagine these tactics executed through a large retail footprint. Imagine the possibilities. This acquisition creates a retail exploratory sandbox Amazon lacked to date. Will Amazon just take their existing tactics and scale them within Whole Foods? I would doubt it. I think Amazon probably has much more in mind for these stores. Possibly redefining grocery shopping as we know it. However, the combination of the two brands (Amazon and Whole Foods) also highlights a weak point of Amazon: they don’t have the best deals. This is very important in the grocery category where many shoppers are shopping for the deal. These Deal Seekers have a rotation of stores (e.g. Kroger, CostCo, Walmart, ALDI) to get the most for their money. They are loyal to the deal, and are able to cut through the deal-vertising to find the best, most relevant deal within their store rotation. Whole Foods was already feeling the pressure of the deal seekers as evidence in the creation of Whole Foods 360 (high-quality items at everyday low prices). The obvious goal was to offer an less-expensive alternative to increase their market share. So the deal may be the Achilles heal, it doesn’t mean Amazon won’t thrive for another simple reason: many people hate shopping for groceries. Over the past few years, more and more grocers are adding eCommerce capabilities to cater to these shoppers who despise grocery shopping. Now this shopper can order and pick-up their groceries or have a service like Instacart, Shipt or Peapod would deliver to their door. This shopper attitude is an interesting opportunity for Amazon. My guess is these shoppers are probably already using Amazon and these eCommerce offerings are still in the early stages of adoption. 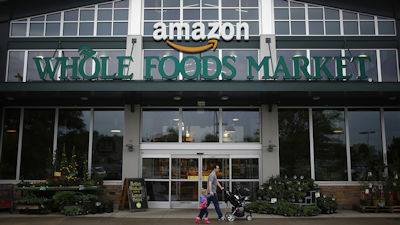 I suspect the marriage of Amazon and Whole Foods will result in a premium grocery shopping experience both in the store and online. This will be appealing to two types of price blind shoppers. The first will be the shopper who enjoy browsing and buying for high-quality groceries in a premium experience (e.g. no lines at checkout, virtual concierge assistance). The second are the couch shoppers who prefer to buy groceries from the comfort of home and have Amazon delivery them. From a shopper perspective, Amazon will appeal to many shoppers. The question is are they willing to change their current grocery store rotation? We are all creatures of habit, and while there are some shoppers who want to try something new, the majority resist change. However, Amazon has an “in” when you think about how many shoppers are currently using them. The curiosity of the new experience may be enough to drive trial, and then change could follow. Who should worry? Well, any store with ecommerce offering should worry, including brands like Instacart, Shipt or Peapod. Amazon accounted for 43% of online retail sales in 2016. Let’s face it – online its Amazon and then everyone else. As more and more people who despise grocery shopping go the eCommerce route, the store becomes less relevant and the eCommerce brand increases in relevancy. Amazon could be the likely beneficiary when you consider many shoppers already actively use Amazon. Amazon Prime Day: Can it be a midsummer Black Friday? Excellent POV, Eric. I had an additional thought: What will these Whole Foods stores look like in 2 or 3 years? 5 years? Amazon’s fresh food business wasn’t growing as fast as the rest of the rest of their retail categories. There seemed to be a “last mile” issue–it’s one thing to have Alexa deliver TP, another to get fresh Roma tomatoes delivered. Acquiring Whole Foods closes that last mile and makes each Whole Foods store a new Amazon fresh food delivery footprint. These stores may become larger scale food hubs enabling faster, fresher delivery. Perhaps in 3 years, these stores are no longer a destination at all, but an Amazon hub just as we’ve seen before, with endless aisles of books, boxes and products. The thought crossed my mind too. Fresh produce was a drawback of Prime Pantry. I totally agree with you – this local presence will give Amazon the ability to play in ways we haven’t fathomed. I like your image of 3 years out. Given Amazon’s technical prowess, nothing seems out of the realm of possibilities.